The Heberts were looking for a way to conceal the large exposed foundation on the front of their home as well as eliminate the large change in elevation from their driveway to their front door. The Heberts were looking for a way to conceal the large exposed foundation on the front of their home as well as eliminate the large change in elevation from their driveway to their front door. They also wanted to give their north west Austin home a more modern style and increase its resale value. 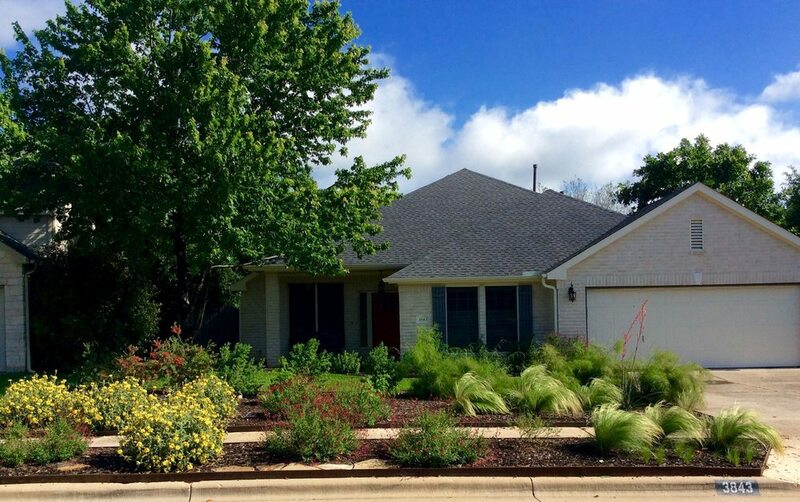 We decided on a large cinderblock and Corten steel retaining wall that would contain a paved pathway and three large garden beds planted with low maintenance plants such as Texas Sage, Red Yuccas and Mexican Feather Grass. The bed on the right use a single focal Alphonse Karr Clumping Bamboo that goes exceedingly well with the modern motif. To begin we poured and 12 inch concrete foot below ground level to support the wall, due to the changes in elevation we needed to add several steps into the footing to ensure it would be out of sight upon completion. On top of our footing we built two large boxes out of cinderblock 8x8x16’ and cinderblock capstones to give a modern slightly industrial look. To join the two boxes we installed a very large 24×5 ft piece of Corten to ensure a seamless steel face for the central garden bed. A perforated pipe bedded in gravel was laid behind the length of the wall to ensure good drainage and prevent future damage to the wall from hydrostatic pressure. We converted an existing irrigation zone to Drip Irrigation pipe and ran the line through a PVC sheathing built into the wall below grade. The Corten and the bamboo beds were then filled with rich, quick draining soil, covered in landscaping fabric, installed drip irrigation and the plants then mulched the beds with a Hardwood Mulch. The box containing the pathway was back filled with sandy loam under the paths with 12 inches of good dark soil under the planted areas. Once the backfill was leveled we installed a few desert plants. The front of the yard used a beautiful arrangement of various drought resistant plant offerings. Once again, the angles were straight and boxy and complemented the modern motif quite well. In the back yard, we established a privacy from the neighbors on the left side with a lush planting of more Clumping Bamboo. With time and care those plants will be anywhere between 15-30′ tall, depending on fertilization and watering. Court yard; the client wanted a green area for their dog’s comfort. Because, Hoover was large dog with high energy levels, regular lawn sod wouldn’t work as it would become patchy fairly quick in such a small area. We opted to use high quality USA made artificial sod that was designed specifically for dog use and is installed extensively in large commercial dog boarding facilities. We decided to go with a nice square shape and further more to use more Clumping Bamboo Plants for the court yard. The final look is cohesive, modern and functional. Hoover is happy and so is the client as the first sight when they open their door is a beautiful, tall and lush bamboo green wall.